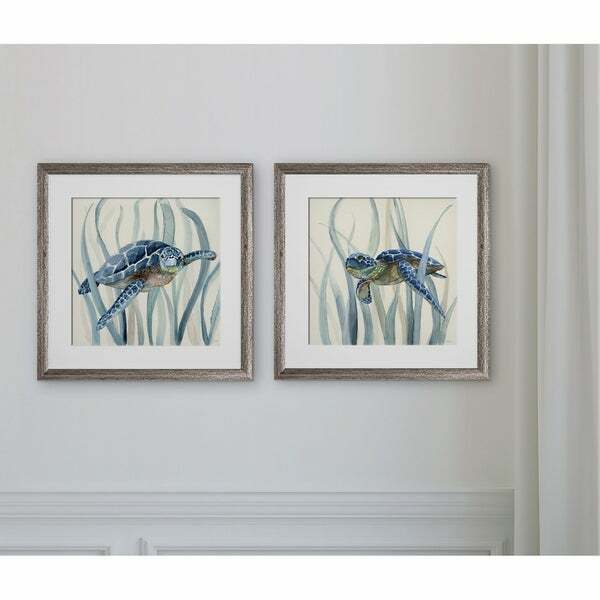 Turtle in Seagrass I -2 Piece Set 2 Custom Framed Prints. 100% and created to last. Individually printed and framed by hand to very high standards. Printed and inspected one at a time utilizing the latest archival UltraChrome Giclee inks Consisting of 2 Total Framed Pieces Each measuring 16''x16'' x .75'' deep Each Piece is Individually Framed Acrylic Glass Each piece includes hanging accessories and is ready to hang. You need only to apply an anchor to the wall of your choice. I love my Sea Turtle artwork. The prints and framing work so well in my nautical themed living room and are true to color. They look just like the images online. The first set arrived damaged, with broken glass. Overstock was quick to the rescue and processed the exchange so that I had a replacement within days. Great customer service. I love the colors in these pictures. They are perfect in our vacation Florida home. Overstock also has great customer service and they adjusted my bill when the pictures went on sale shortly after I ordered them!